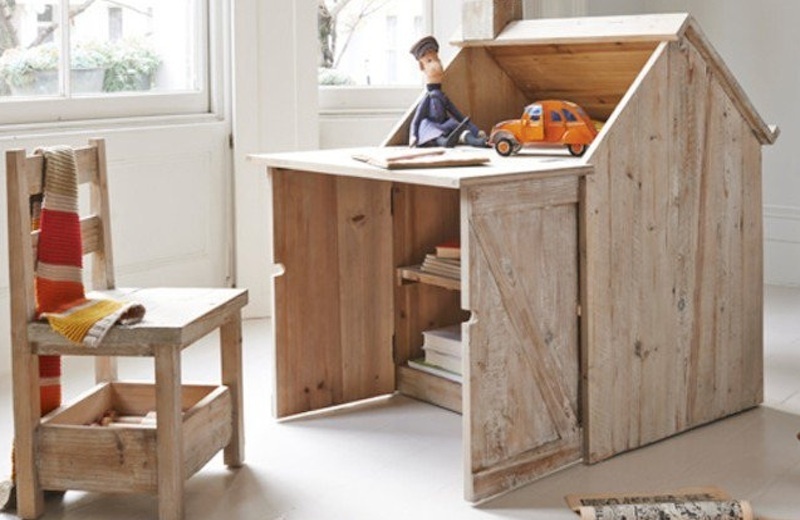 Whether you live in a tiny house, a mansion, or somewhere in between, whether you have toddlers or elementary-schoolers, you will thank the folks at Loaf for their ingenious children’s desk design. The hybrid Roofus transitions easily from a sweet playhouse with deep shelves that can store dolls and tiny furniture when playtime is done, to a fully functioning desk/storage space combo that gives us hope for a streamlined, tidy kids’ space. Just fold down one side of the roof and you have a spacious area for homework, books, or LEGO building and plenty of room below for little libraries (or larger toys, since the interior shelf is removable). The “chimney” from the dollhouse also serves a functional purpose — it’s a moveable holder for pens, pencils, and paintbrushes. The opposite side roof becomes an easel for artistic endeavors, which means multiple children can use the Roofus at the same time. The solid fir multitasking desk has a beautiful, old-world feel to it which is hard-earned: the wood is hand selected from the remains of old buildings and then finished by hand for a well-loved look. And it comes with a matching chair that, of course, also features a convenient cubby below. If every piece of furniture was this well-considered, we’re pretty sure we’d have the organized, uncluttered home that exists for the moment only in our minds. Whether you live in a tiny house, a mansion, or somewhere in between, whether you have toddlers or elementary-schoolers, you will thank the folks at Loaf for their ingenious children's desk design. The hybrid Roofus transitions easily from a sweet playhouse with deep shelves that can store dolls and tiny furniture when playtime is done, to a fully functioning desk/storage space combo that gives us hope for a streamlined, tidy kids' space. Just�fold down one side of the roof and you have a spacious area for homework, books, or LEGO building and plenty of room below for little libraries (or larger toys, since the interior shelf is removable).�The "chimney" from the dollhouse also serves a functional purpose -- it's a moveable holder for pens, pencils, and paintbrushes. The opposite side roof becomes an easel for artistic endeavors, which means multiple children can use the Roofus at the same time. The solid fir multitasking desk�has a beautiful, old-world feel to it which is hard-earned: the wood is hand selected from the remains of old buildings and then finished by hand for a well-loved look. And it comes with a matching chair that, of course, also features a convenient cubby below. If every piece of furniture was this well-considered, we're pretty sure we'd have the organized, uncluttered home that exists for the moment only in our minds.